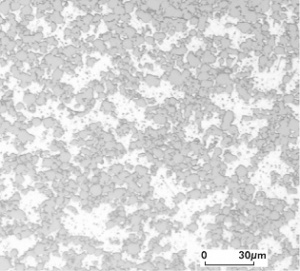 The trade name VAKURIT is assigned to a family of low gas content contact materials developed for the use in vacuum switching devices Table 1. Contact materials of W/Cu, W/Ag, WC/Ag, or Mo/Cu can be used in vacuum switches if their total gas content does not exceed approximately 150 ppm. In the low gas content W/Cu (VAKURIT) material mostly used in vacuum contactors the high melting W skeleton is responsible for the high erosion resistance when combined with the high conductivity copper component which evaporates already in noticeable amounts at temperatures around 2000 °C. Since there is almost no solubility of tungsten, tungsten carbide, or molybdenum in copper or silver the manufacturing of these material is performed powdermetallurgically. The W, WC, or Mo powders are pressed and sintered and then infiltrated with low gas content Cu or Ag. 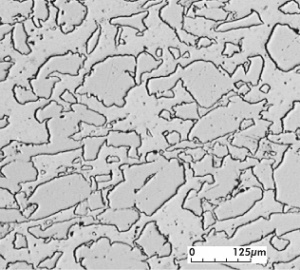 The content of the refractory metals is typically between 60 and 85 wt% Figure 1, Figure 2. By adding approximately 1 wt% antimony the chopping current, i.e. the abrupt current decline shortly before the natural current-zero, can be improved for W/Cu (VAKURIT) materials Table 2. The contact components mostly used in vacuum contactors are usually shaped as round discs. These are then attached by brazing in a vacuum environment to their contact carriers Table 3. As contact materials in vacuum interupters in medium voltage devices low gas materials based on Cu/Cr have gained broad acceptance. The typical chromium contents are between 25 and 55 wt% Figure 3 Figure 4. 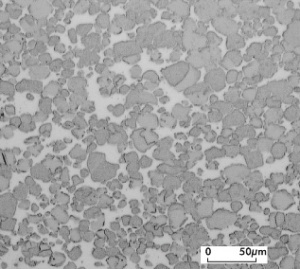 During the powder metallurgical manufacturing a mix of chromium and copper powders is pressed into discs and subsequently sintering in a reducing atmosphere or vacuum below the melting point of copper. This step is followed by cold or hot re-pressing. Depending on the composition the Cu/Cr (VAKURIT) materials combine a relatively high electrical and thermal conductivity with high dielectric stability. They exhibit a low arc erosion rate and good resistance against welding as well as favorable values of the chopping current in medium voltage load switches, caused by the combined effects of the two components, copper and chromium Table 2. The switching properties of Cu/Cr (VAKURIT) materials are dependent on the purity of the Cr metal powders and especially the type and quantity of impurities contained in the chromium powder used. Besides this the particle size and distribution of the Cr powder are of high importance. 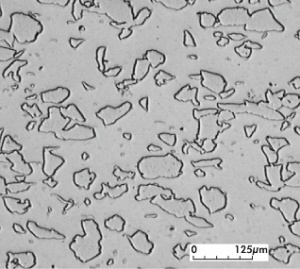 Because of the getter activity of chromium a higher total gas content of up to about 650 ppm compared to the limits in refractory based materials can be tolerated in these Cu/Cr contact materials. Besides the more economical sinter technology also infiltration and vacuum arc melting are used to manufacture these materials. Cu/Cr contacts are supplied in the shape of discs or rings which often also contain slots especially for vacuum load switches in medium voltage devices Table 3. Increased applications of round discs can also be observed for low voltage vacuum contactors.